Still from event Kickfest Bandung 2010, an event that brings all Clothing and Ditribution Store from Indonesia. Kickfest an annual event from Kreative Indonesia Clothing Kommunity (KICK). Kickfest Bandung 2010 is fourth event Kickfest in Bandung, and a third Kickfest for the year 2010. In the year 2010 Kickfest using theme of Get Real for all events that have been done. 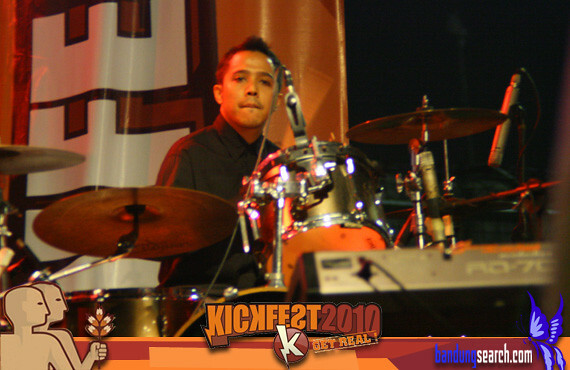 In the year 2010 was Kickfest located in Stadion Siliwangi Bandung, West Java on 16-17 July 2010. Presenting more than 170 both Clothing and Distributon Store from many cities in Indonesia and peformances of many band indie. When day one of Kickfest Bandung 2010 Get Real, on Friday 16 July 2010, Mocca is a cover band onstage that day. Mocca is a band indie from Bandung has many fans in Indonesia. Bands that have been established since ten years ago are typical of their music with a distinctive vocal color. Every listen music from Mocca do not ever say you do not want dancing, especially when when you can listen to the sound of flutes from the vocalist and trumpet very melodic. Mocca has the characteristics of music that crispy but soft, very happy can listen music like that, especially in an atmosphere of calm. Mocca gave name of their genre music with Story Telling Pop, a genre of music that has a basic pop but do with version of Mocca. 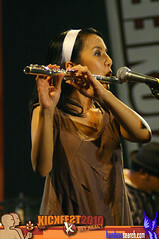 Mocca consists of Arina Mocca Ephipania Simangunsong (vocals and flute), Rico Prayitno (guitar), Ahmad Pratama (bass) and Indra Massad (drums). On July 11, 2010 located the backyard of a house on Jl. Setiabudhi 56, Bandung. The show also represents their gratitude to their fans who have been loyal for 10 years to accompany them to a career. 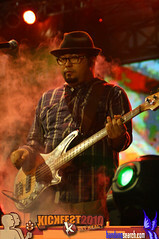 In the event that took place that afternoon Mocca launching “Mini Album Mocca 2010“. When it has Kickfest Bandung 2010 Get Real of 21:15 hours, to audiences who attend that mean to enjoy peformances for Mocca. Mocca started their stage with “Babby You’re A Fool“, this is one new song Mocca contained in “Mini Album Mocca 2010“, this song made also in the acoustic version too. These songs sound casual, but has a very strong vocal power. The next song is “I Would Never” this song is also included in the new album Mocca, this is really old song, but made in a new musical version. “My Only One” next song, this is one of the hits Mocca and has long played so do not be surprised if the audience glad to hear it, we want to do dance when listen this song. The next song is “I Remember” is one of the most popular songs from this band. Continued with a new song from Mocca is still contained in the “Mini Album Mocca 2010” song was “Promises”. Still from the new mini album Mocca “Lucky Me” is next, really on track with a touch of melody to dance. Followed by “The Best Thing” so fun can menedengar this song live. “Mars Persib” is the song to stop performances from Mocca that night. Persib a Football Club that became the pride of Bandung City. Persib are characteristic of Bandung city, and Mocca has doing in the right place, Stadion Siliwangi. It was very precise in position. Beautiful pictures. Makes me remember this great time! this picture from our friend as fotografer.